This is a follow up to my post “A roadbump while looking for records”. You should read that first. I googled the office address of the DBT therapist that I got off of his website. I found the therapist who moved into his office after him. I figured it was a long shot, but called her anyway. She got back to me promptly and was very kind and apologetic, she said that she didn’t know how to contact him. But then the next day I got a voicemail message from the DBT therapist. Apparently she had found a way to get in contact with him. He didn’t leave a number in the message, but said he would call again to try to reach me later. I waited a bit over 2 weeks without a call back from him. I had no phone number to call him at. I called back the therapist who had moved into his old office and left her a message. Shortly after, I got a call from the DBT therapist. I wasn’t able to get him to agree to send full records (not a surprise) but he agreed to send a summary letter. Finally I got a letter from him in the mail. No return address listed. I think he must not be practicing right now, because I never got a contact phone number for him and the letter doesn’t even have an office address as a heading or footer. Also, after speaking with him he took down the entire website with his outdated contact information. I scanned the letter and put it up here. Edited out some identifying bits. The envelope was post marked April 9th. So it took over a month from when I started at the end of February trying to contact him to when I got the letter in the mail. This was probably the most work I have gone through to get any records and the least fulfilling. 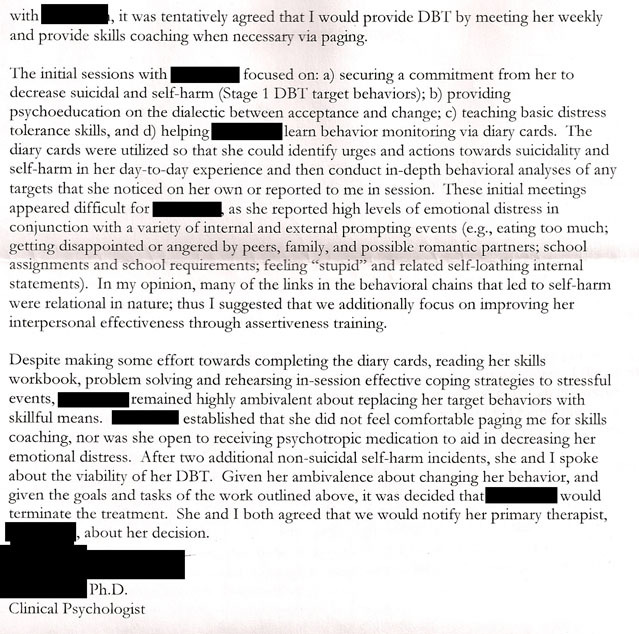 It reads mostly like a textbook explanation of DBT. So little of the content of the letter feels specific to me. 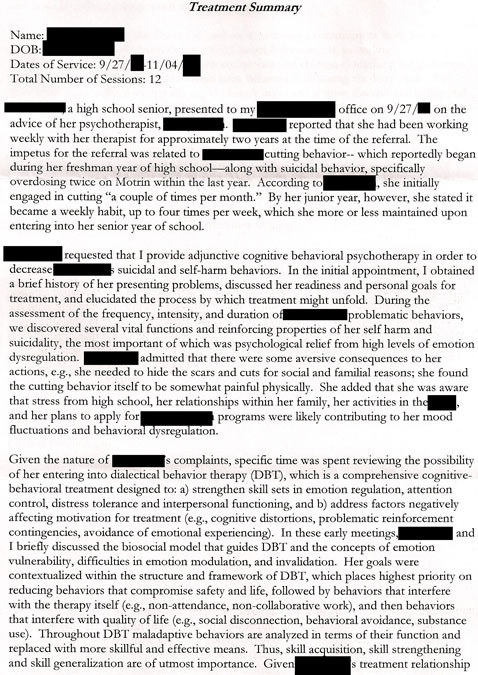 I got a kick out of the bit where he wrote “We discovered several vital functions and reinforcing properties of her self harm..” as if I hadn’t already had an understanding of these before meeting him. I realize 12 sessions is not a huge number of sessions, but I don’t think it is an insignificant number either. I get the feeling reading the letter and based on our no-pleasantries-exchanged-phone-conversation that he didn’t remember me and struggled to write the letter based on a few scribbles in a notepad. I was most interested in how he would describe terminating the treatment. He kept telling me that I needed to call him if I was going to cut. If I couldn’t agree to call him then he told me we couldn’t meet any more. Phone anxiety aside (This has gotten better over the years, but never completely gone), I didn’t want to do this because it is hard for me to judge if I am going to cut in a situation or not. I don’t really know if I’m going to cut until I’ve done it. I think about cutting a lot. Only a very small percentage of the time do I act on it. If I called him and then did not cut after the phone call (even though the purpose of speaking to him was to help me avoid cutting) I would have felt guilty for making the phone call. If I didn’t cut then, I would have bothered him for no reason. I’d have worried I had called him during a time when I wasn’t going to cut anyways. I probably would have half-heartedly made a small injury to ease my guilt. His request for me to phone him would actually increase my self injury rather than decrease it. And I’m fine with my self-injury in general (I was pressured into going to the DBT and was very ambivalent about it) but that doesn’t mean I want to intentionally enter into a situation that will needlessly increase it. I’m not sure how well I articulated that to him. I’m better at expressing some of these things now, because my meta-cognition has further developed. Whatever the reason, he doesn’t appear to have understood my objection to the phone calls. Still I had often wondered if he realized he messed up when he told me ‘phone calls or no therapy’. I imagine he thought the ultimatum would get me to fall in line with his rules, but it backfired and I left. His letter reads as if it were more of a mutual agreement, instead of a “do this or leave” command. Would people be interested in more posts like this where I post some of my records with comments? I have a few other topics I want to talk about here first, but if people are interested, I can also do more like this one later.